Polish artist Dominik Lejman incorporates viewer interactivity into his paintings in a way that recalls video art of the early seventies, notably Dan Graham's. In Lejman's piece, Yo Lo Vi, 2007, for example, the artist projects a delayed image of the viewer over a painting with a reflective surface. The painting depicts a male figure whose hands are tied behind his back and whose head is hidden by a white cover that appears half dunce cap, half torture hood. Torture is the main connotation though, given not only the man's bound hands, but also the foreboding, shadow background. Therefore, the viewer, cast without permission in this macabre scene, is impliedly complicit in a violent act. A discomforting placement for sure, and it's a placement that recalls Dan Graham's early video experiments in surveillance and time delay, notably the eponymous Opposing Mirrors and Video Monitors on Time Delay, 1974/1993. In this piece the audience is videotaped, their recording appearing on a monitor visible in a mirror as it looked a few seconds before their real time mirror image. However, unlike the time delay in Graham's video, which according to the artist was meant to create a time warp that had a psychedelic drug-like effect on the viewer, Lejman's hesitant response bends reality to reveal its dark, violent undercurrents. Accordingly, Lejman highlights a universal human capacity for violence, and as viewers, we're part of it, like it or not. Rarely does a private Toronto gallery mount an exhibition that puts the curation of public galleries to shame. Toronto Letter – A Concise Colour Bar Survey 1966 – 2017 is one of them. This five-decade survey of British Columbia-based painter Michael Morris, which Paul Petro curated, stands out for succinctly linking abstract painting to quotidian life, and in doing so, enhances the history of modern painting in Canada by countering the frequent portrayal of abstraction as autonomous. This exhibition of paintings, video, and works on paper stems from two key influences that develop the exhibition historically and theoretically: The Letter Paintings and The Colour Bar Project: 1970 – 1978. Each of The Letter Paintings (1968-9) comprise graduated vertical colour bands. The series’ title, referring to written letters, signifies a communique with the outside world. Accordingly, the paintings are not discrete: the act of walking by them as if they were part of a streetscape is integral to their interpretation. These are influential paintings, and not just here in this survey. Their lineage can be seen, for instance, in Ian Wallace’s photographs pairing street scenes with Modernist abstract forms. 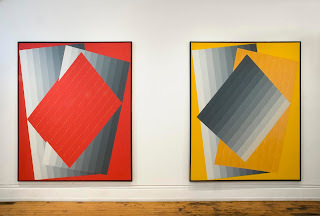 Referencing the series in this exhibition are more recent paintings including Gelbe Liebe, 1990 and Rote Liebe, 1990, respective yellow and red monochromes composed of red or yellow plus greyscale diagonal and tipped vertical bands. The welcoming of the ambulatory viewer or passerby into The Letter Paintings and subsequent works, for one thing via architectural references that imply an ordinary street scene, is important for linking Morris’s paintings to the second exhibition building block: The Colour Bar Project 1970-1978. A collaboration with Vincent Trasov, this project was an ongoing colour research project that resulted in 1,900 small colour bars (enamel painted on 7" x 1 5/8" x 3/4" blocks of wood): monochromes in seven colours, grey scales, and full spectrum. Painted at Trasov’s and Morris’s bucolic and bacchanalian studio in Robert’s Creek B.C., the colour bars are set against a natural backdrop in the included Colour Research, Babyland, 1972-1977 (a DVD conversion of 202 slides). Here perhaps more than anywhere else in the exhibition, Morris explicitly connects abstraction to real life. Morris’s bridging of painting to the everyday is too often overlooked in historic accounts of his work. For instance, Dennis Reid’s entry on Morris in the authoritative A Concise History of Canadian Painting, grants Morris’s canvases formal rather than situational analysis. Entirely absent in Canadian art history is a history of queer abstraction that Morris arguably initiated, a history that among others included General Idea (whose Colour Bar Lounge, 1979, was influenced by Morris’s and Trasov’s project and whose ziggurat paintings show a similar interest in that form that Morris did in preceding works such as the included silkscreen, Babylon, 1967). Morris’s paintings, like General Idea’s installations and paintings, blur boundaries between pictures and the public in an abandonment of strict, largely heterosexual formalism. The expansion of the Canadian painting field makes Paul Petro’s tightly-curated show an important one historically and thus a highlight of Toronto exhibitions this spring.